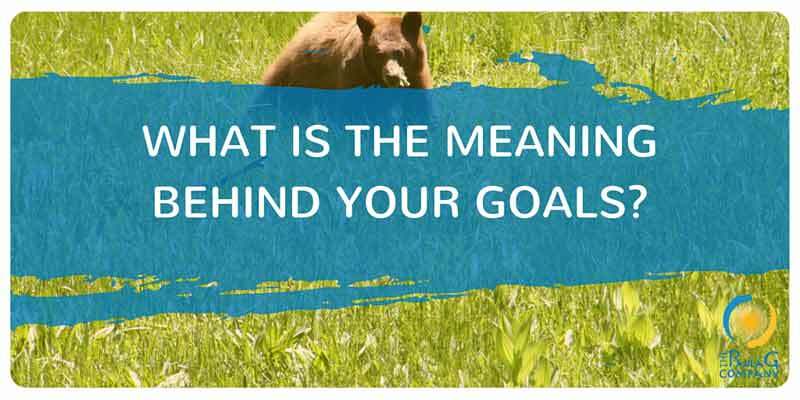 What is the Meaning Behind Your Goals? You are here: Home / Business & Prosperity / What is the Meaning Behind Your Goals? Everyone talks about goals like they are the be-all end-all destination for success. While it is true that getting clear on your goals makes you exponentially more likely to achieve them, true clarity has more to do with meaning than being “SMART”. For example, most business owners have some sort of yearly and monthly financial goals. After all, without a financial goal you won’t be in business for long! Yet the mistake I see so many entrepreneurs make is that they stop there. They stop with “I want to make $8,333 per month or $100,000 this year.” End of story. That’s a nice goal, but it is fairly hollow without further inspection. There are lots of people who have that goal, many whom will never even get close to reaching it. The inspection and introspection I am inviting you to do with each and every goal you have (financial or otherwise) is to run it through two very important lenses. 1) What does this goal mean to me? What makes it meaningful? What will you have when you achieve the goal that you do not have now (and I don’t just mean more mo ney!)? Why does this matter to you in the bigger context of your life? This lens is important because if your goals aren’t anchored in the bigger picture, your deeper “why”, then it is just some target thrown out there at random to keep you working hard, avoiding the deeper issue, or feeling bad about yourself. As one of my clients says it’s like “we’re making really great time but we don’t know where we’re going or why we’re going there!” Exactly! If you are going to orient your life energy to move toward something, be certain it is a meaningful direction. 2) Who do I want to be and how do I want to navigate as I take action toward my goals? “How do you want to navigate” and “Being fearlessly authentic” are two fundamental components of the Intuitive Intelligence flow I created because they are THAT important. If you lose YOU in the process of pursuing any goal, what is the point? Looking through this second lens is critical because in a culture of “make it happen” and “succeed at any cost” you can easily lose sight of who you truly are and why you are here in the first place. There are many different ways to get to a given outcome. How do you want to get there? Do you want to try and be someone you’re not just because someone handed you a 7-point system and told you this is the way it needs to be done if you want to be successful? Here’s a million dollars of free coaching for you right now – trying to be someone you’re not does not work. Period. Ever. If you’re going to reach your goal but hate who you’ve become to get there, you’ve lost no matter how lofty the goal. I’ve gone through the pits of this sort of personal hell and back again. So I tell you this from first-hand experience with all the bumps, bruises, and wrong-turns. How you want to navigate is about who you get to touch and what you get to give each and every day. This is where legacies are formed. By creating the experience you most desire along the journey, you’ll immediately be richer than any goal achieved can offer you. So as we move toward the next half of this year… take some time to revisit your goals and run them through these two lenses. Allow what you discover to guide your next inspired actions and any changes you need to make. Are your goals truly aligned with what you really want? Are you on track to achieve them this year? If you’re ready for a new perspective and someone to guide you so you make good time AND have a meaningful destination, contact me.